1) Your registration details may be shared with staff from the school you list in your registration details. 2) If you indicate you would like to receive an SMS reminder, this will be sent to the mobile number you entered and you are responsible for any costs incurred by you through your mobile provider. Your mobile number will never be shared outside the University of New South Wales. 3) You acknowledge that for any reason, scheduled activities, events, information evenings, master classes or workshops may be cancelled at any time. UNSW will make all reasonable efforts to inform you of a cancellation as soon as possible. 4) If the activity, event, master class, workshop or performance you are registering to attend occurs during the school day, it is your responsibility to contact your school and obtain permission to attend the activity. 5) UNSW's Copyright and Disclaimer as well as Website Privacy Statement also apply. Give yourself the best possible chance of being made an offer to UNSW and join the thousands of student's receiving hints, tips and admissions info direct to their email. We respect your email privacy and will never disclose your email address to anybody else without your permission. From preparation to get the most out of your Info Day, to tips and tricks for the day itself - find out everything you need to know about UNSW's 2018 Info Day below. Info Day is your chance to experience UNSW up close! Get answers to all your degree related questions from current staff and students, tour the campus and find out how to make the most of university life. There'll be representatives from Scholarships and Exchange, as well as lectures and hands on experiences for you and your friends to get involved in. Come and be a part of the festivities on campus! Who should come to Info Day? Info Day is a day for prospective students to get all the information they need about further study, particularly those who are looking to get their last minute questions answered before locking in their degree preferences! Students of all ages are welcome, as are their parents and families. Info Day is also a celebration of university life, so community members and alumni are also encouraged to attend. When and where is it held? This year Info Day falls on Saturday, 15 December 2018 and will be held at our Kensington Campus. The event kicks off at 9am and will be continuing all day until 4pm. There’s plenty to do and experience, so come for an hour or make a day of it! UNSW is easily accessible by car and public transport. Free parking is available on campus on the day and express buses will be running from Eddy Ave at Central Station to the Kensington Campus all day. For more information, visit the Getting Here page. Info Day is an experience best shared with your nearest and dearest. Parents, grandparents, friends - everyone is welcome! Registration is not compulsory, but signing up will give you updates and reminders about Info Day direct to your inbox. You can register here. How do I know what's on? 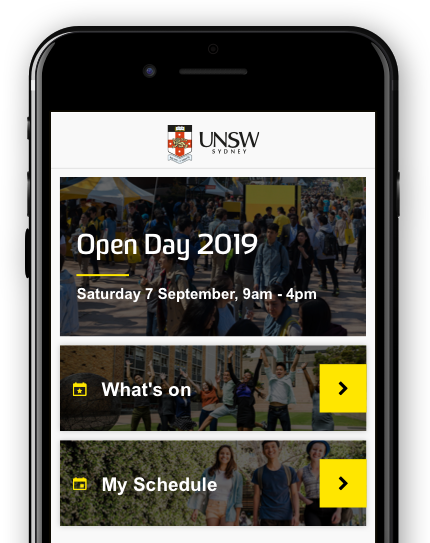 The UNSW Uni-Verse Official App for Info Day has an excellent 'Plan My Day' tool, which lists all the activities that are happening on campus. You can search by interest area, add the ones you like to your own individual plan, then share the plan with your friends. The app makes navigating our Kensington campus simple by showing where your planned activities are on a campus map, along with clear directions and walking times between locations. You will also receive a notification 15 minutes prior to the start of your next activity so you will know exactly when you need to start making your way there. You will also be able to provide feedback for each lecture you attend. The App will launch on Wednesday, 5 December 2018. In the meantime, you can search through all the activities on the 'What's On' section of the Info Day website. I've arrived on campus. Where do I start? Your first stop should be the Advisory Centre in the Scientia Building. There you can pick up a goodie bag and get all your degree related questions answered before moving on to explore the rest of campus. Look out for our friendly Student Ambassadors in yellow shirts who will help you find your way around campus and answer any questions you have about the activities and lectures running on the day. How do I navigate the campus? UNSW is like a mini city - it even has its own postcode! To get started, you can print off this Campus Map, which easily points out the main areas for Info Day. A comprehensive campus map with directions and walking times between locations will also be available on the official app. There'll also be big yellow and black signage on the day to help you find the main lecture theatres and hubs. If all else fails, you can ask a Student Ambassador (wearing the yellow shirts) who will be happy to point you in the right direction. Where do the Campus Tours depart from? Campus Tours leave every half hour (last tour departing at 3pm) from outside the Advisory Centre at the Scientia Building (map ref G19). Led by Student Ambassadors, these 45-minute tours will cover the key sights on campus, as well as give you an insight into the history and student experience at UNSW. I have a disability. What should I expect on Info Day? Our Kensington Campus is fully wheelchair accessible. You can also find the accessibility map for our Kensington campus on the official app. If you have any questions about navigating the campus or the support services available for students, have a chat to our Disability Services staff by calling and let them know you're coming to Info Day - (02) 9385 4734. On the day, our Accessibility Ambassadors will be on hand to assist, so ask them if you have any questions or require assistance. An Accessibility Ambassador will be available at each information stall around campus (look out for the Student Ambassadors in yellow shirts) and will also have a dedicated stall outside the Advisory Centre at the Scientia Building. Help! I can't make it to Info Day! What do I do? Additionally, if you are looking for advice before UAC preferences close on Sunday, 16 December 2018 our Future Students Enquiries team are here to help. The UNSW Enquiry Centre is open from 9am-5pm Monday-Friday. Additionally, we will be open for extended hours following the ATAR release in December (8am-8pm Friday 14th, 9am-5pm Saturday 15th and 11am-6pm Sunday 16th) and are happy to offer you advice and support. Give us a call on 1300 UNI NSW (1300 864 679).